Golfer’s elbow is also known as medial epicondylitis. It causes pain on the inside of the elbow which develops gradually over time. It is sometimes known as thrower’s elbow or little league elbow. The main symptom of medial epicondylitis is pain and tenderness on the inside of the elbow, specifically over the medial epicondyle (prominent bony protrusion) where the flexor muscle in the forearm attach. 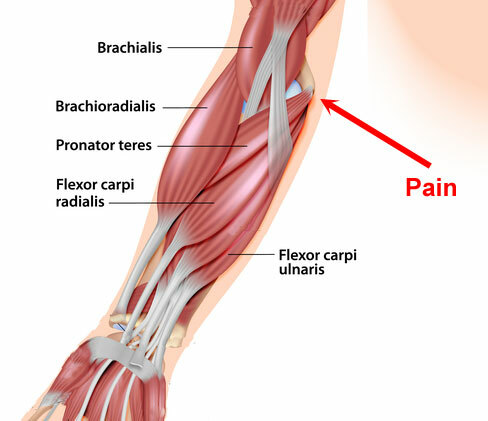 Pain is worse when attempting to grip things hard and will be a general weakness in the wrist. When assessing Golfer’s elbow, the pain will be reproduced by bending the wrist (palm downwards) against resistance and when resisting pronation (rotating the wrist inwards). Medial epicondylitis usually comes on gradually over time and is an uncomfortable niggle with recurrent stiffness before it develops into a painful injury causing the athlete loss of function. The muscles of the wrist flexors and pronator muscle insert at the medial epicondyle on the inside of the elbow. These muscles are involved in bending the palm downwards, rotating the forearm inwards and helping to grip. Overuse causes the tendon which joins muscle to bone to become inflamed causing pain at the point of attachment. In long-term chronic cases, degeneration of the tendon may be a more accurate way of describing what is happening rather than acute inflammation. Medial epicondylitis is caused by repeated wrist flexion or bending the wrist, particularly against resistance such as holding a golf club. Tennis players who have a powerful forehand with lots of topspin are also at risk. It is also common in throwing events. Throwing a Javelin with a poor, low elbow technique puts a huge strain on the inside of the elbow. Likewise, Baseball pitchers are also at risk. It is important to recognize any early warning signs and rest the elbow before the injury develops into something more chronic and difficult to treat. However, most causes of medial epicondylitis may not be sport related but caused by work stresses. Repetitive strain from using keyboards or manual labour like carpentry/DIY where grip strength is important are very likely to develop overuse injuries. In order to maximize the chance of successful rehabilitation, it is important to apply as many treatment approaches as you can. There is unlikely to be one single cure and different people will respond differently to certain treatments. Identify possible causes of injury. It is important throughout the rehabilitation process to maintain fitness in ways that do not stress the elbow, for example, running or strength training so long as it is not painful. Rest from activity that causes pain. Rest is very important. Continuing to use the wrist may result in the injury becoming chronic which is much more difficult to treat. If you are a golfer or a thrower then stop playing. It is not just sports that causes this injury or may aggravate it. Gripping anything tightly or for long periods may make it worse, even opening heavy doors. Rest means rest! Apply the PRICE principles of protection, rest, ice, compression, and elevation when the injury is acutely painful. A cold therapy and compression wrap can be applied for 10 to 15 minutes every hour. After the first few hours, this can be reduced to 3 to 4 times a day as required. Later in the rehabilitation program or if the injury becomes chronic applying heat may be more beneficial. Wear a brace, support or heat retainer. This will give support and help prevent further injury. A Tennis or Golfer’s elbow type brace is worn around the forearm just below the elbow and changes the angle that the forces transmit through the tendon, hence taking some of the strain off the injured part. After the initial acute phase, which may take anywhere from 2 days and 2 weeks depending on the severity and how much rest it gets, applying heat and using a heat retainer or elbow support may be more beneficial than ice. Heat will help stimulate blood flow which aids healing. A doctor may prescribe NSAID’s (Non-Steroidal Anti-inflammatory Drugs) such as Ibuprofen can help reduce pain and inflammation, especially in the early stages. It is thought they are less helpful later in the rehabilitation process. Always check with a Doctor before taking medication. You should not take Ibuprofen if you have asthma. A physiotherapist or similar may use electrotherapy such as ultrasound or laser treatment to help reduce pain and inflammation. Sports massage can help in the rehabilitation process, especially after the acute stage and for stubborn injuries that fail to heal. Cross friction massage to the tendon can help stimulate healing. Applying sports massage to the muscles of the forearm can help reduce tension in the muscles improving their function which long-term should help reduce the strain on the tendon at the elbow. Apply cold therapy after massage treatment. A steroid injection may be considered if more conservative treatment is not effective. It may heal quickly within two weeks but you could suffer from Golfer’s elbow for months, particularly if it is not allowed to rest in the early days. Expert interview: Controversial in their management, not everyone agrees on what is the best course of treatment and the vast majority of conditions to improve with conservative treatment such as ultrasound, physiotherapy or occasionally a steroid injection. Or indeed now patients may be treated with platelet-rich plasma injections which is where blood is taken from the patient themselves and a centrifuge the clotting and healing factors of the patient’s blood can be injected into the site of the injury where the tendon has frayed. The surgical treatment of golfer’s elbow consists of recessing and releasing the portion of the diseased tendon, of the frayed tendon, removing this and releasing it from the bone. There are more modern techniques used to perform the operation using endoscopic or arthroscopic techniques where from inside the elbow we identify these structures and cut them. and there are different methods with respect to how big the scar is, however, the principle is the same and that is to remove or release the diseased portion of the tendon from the bone. Overuse is the main cause of throwers elbow. Doing too much, too soon without allowing your body to recover. Keep a training diary. This will allow you to look back and identify if you have been overtraining. The chance of suffering overuse injuries is greatly increased if you have a faulty technique. For example, throwing a javelin or ball with a ‘low elbow’ technique will place far greater stress on the tendons on the inside of the elbow than a correct technique. Particular attention needs to be paid to the technique of the golf swing or tennis forehand if the athlete is involved in these sports. Stretching is an important part of the rehabilitation process and should begin as soon as pain allows and be continued throughout the rehabilitation program and beyond. Stretches for the wrist flexor muscles are most important. Hold stretches initially for 10 – 15 seconds – during the acute stage. Later stretches should be held for up to 40 seconds. Repeat stretches 5 times and aims to stretch at least three times a day. Strengthening exercises should also begin as soon as pain allows and this will depend on how bad the injury is. If it hurts during the exercise, after or makes it worse the next day then do not do strengthening exercises. Be patient! Start with static or isometric exercises which are done without movement of the wrist or elbow. When these can be done comfortably without any pain then move onto concentric and eccentric exercises, particularly, for the wrist flexor muscles. It is important that strengthening exercises are done before trying to return to activity so the load through the tendon is gradually increased. Apply cold therapy after strengthening exercises to prevent inflammation. It is better to air on the side of caution and start later rather than too soon. Working the elbow too soon may just cause symptoms to return. If you feel pain, stop and wait until such time as they can be performed without pain. Repeat the exercises daily and assess any effect on the elbow immediately after as well as the next day. Isometric flexion – Rest the forearm on a flat surface such as a table or bench with the palm facing up. Start with the wrist in an extended position (fingers pointing down). Use the other hand to resist as you attempt to flex the wrist. There shouldn’t be any movement at the wrist. Start at around 30% of your maximum effort. Hold this contraction for 5-10 seconds and then rest. Repeat 5-10 times. Gradually increase the duration of the static contraction until you can manage 10 contractions of 10 seconds without pain. Golfers elbow is an overuse injury so don’t overuse it with the rehab exercises and end up back to square one. Less is often more in this case. 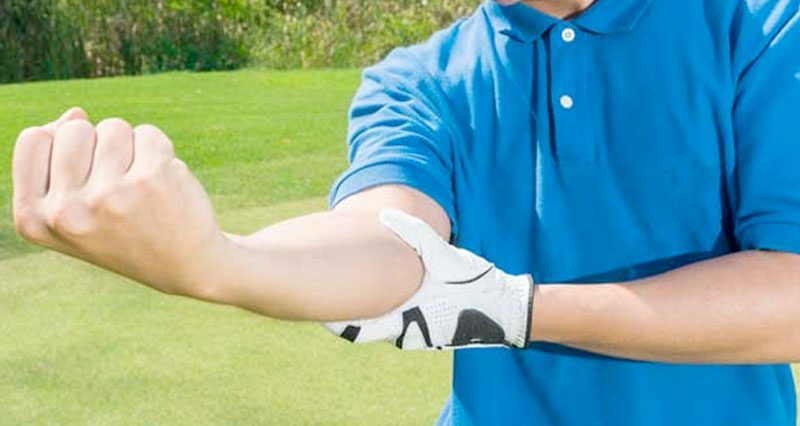 Wrist flexion – specifically works the muscles involved in golfers elbow. Rest the arm on a flat surface, with the forearm and palm facing upwards. Curl the weight up and down keeping the forearm and wrist still. Start with 3 sets of 10 repetitions daily and build up gradually up to 3 sets of 30 reps. This should be done gradually and begin only when you can perform the activity without pain. When you can comfortably manage the strengthening exercises then it may be possible to return to activity. If you are a thrower, ensure you have the correct technique. Wearing a brace can help take the strain off the elbow during the return to full fitness. For golfers, practice strokes without a ball to start with. Introduce a ball and gradually increase power in shots and number of practice shots played. For example session 1 – 20 strokes at 20% effort. Session 2 – 30 strokes at 40% effort and so on. This gradual increase should take place over a six week period. If you find you have pain during, after or the next day then take a step back. Throughout this phase, it is essential that stretching and strengthening routines are maintained.